Jupiter marbles have an opaque base with flecks of an assortment of colors on the surface of each marble. They are iridized to have a shiny, reflective surface similar to the surface of oil. Toebreakers are approximately 47-48mm or almost 2" in diameter. 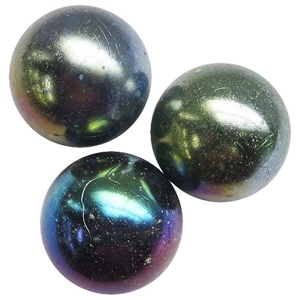 They are sold in packs of 3 or 20 marbles. Sizes and colors will vary slightly.